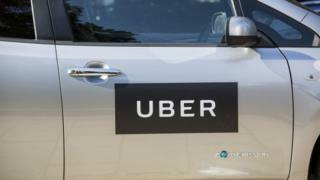 Uber has been banned in a third UK city after councillors in York rejected the firm's bid to renew its operating licence. Taxi drivers had complained of the city being "overwhelmed" with drivers using the ride-hailing app, which has already been banned in London and Sheffield. Concerns about a huge data breach also contributed to the decision, the City of York Council said. All vehicles and drivers were checked, he added. "This is a disappointing vote for the riders and drivers who use our app in the city," he said. Uber said it would review the decision once it had received the formal notice from the council. Speaking before Tuesday's council meeting, Saf Din, Chair of York Hackney Carriage Association, said the city was being overwhelmed by out-of-town drivers. "We must also have every driver from Bradford here at the moment," he added. Wendy Loveday, chair of the York Private Hire Association, said there was also an issue with passenger safety. Uber had its licence suspended in Sheffield after it failed to respond to official requests about its management. Transport for London, which has criticised the firm's record over reporting criminal offences and carrying out driver background checks, decided not to renew Uber's London licence after it deemed the firm "unfit" to run a taxi service. Earlier this week, Uber was slammed by a nurse who was quoted up to £149 for a 10-mile trip to work in the snow. What does London’s Uber ban mean?